Been considering the Knog Oi as your next bike bell purchase? The Knog Oi started as a Kickstarter campaign and in less than 24 hours, they were able to reach their funding target. Seems like a lot of people really liked the idea of this product, right? CNC-Machined Ringer. Knog uses CNC-machined 7075 and aircraft-grade aluminum for a tougher, rust-resistant and long lasting bell. Anodized Body. Knog used anodized metal surface along with strengthened nylon for an overall top of the edge performance. Diverse Sound. A lot of you may not recognize, but the Knog Oi does have a distinct sound that makes it different from other bike bells. This one particularly has several pitch tones (core and other higher tones) to ensure that you can be heard. Distinctive Design. From afar, many wouldn’t consider this as a bike bell because of its low profile and sleek design. Available in 2 Sizes. Small and large. The small Oi can fit around 22.2 mm handlebars while the large Oi can be used on 31.8 mm bike bars. 4 Color Options. Choose from copper, black, brass and aluminum. Not that loud. While the it can be heard by other people when used, it's not that loud compared to its competitors. Who is the Knog Oi For? The Knog Oi Bike Bell is a big hit in the cycling industry. It’s innovative and gives cyclists new ways to perceive bike accessories. They’re a new, trendy and one of a kind bike bell; therefore it’s for anyone who wants to ride their bike in a fresh and sleek kind of way. Additionally, since they have both small and large sizes, they can be used on mountain, commuter, road and fixed bikes. At one glance, no one would think that the Knog Oi is a bike bell. For many years, cyclists have to settle for a cheap bike bell. Fortunately, one of Knog’s co-founder realized this gap in the market and made a campaign on Kickstarter that was funded 30 times than its original funding target. 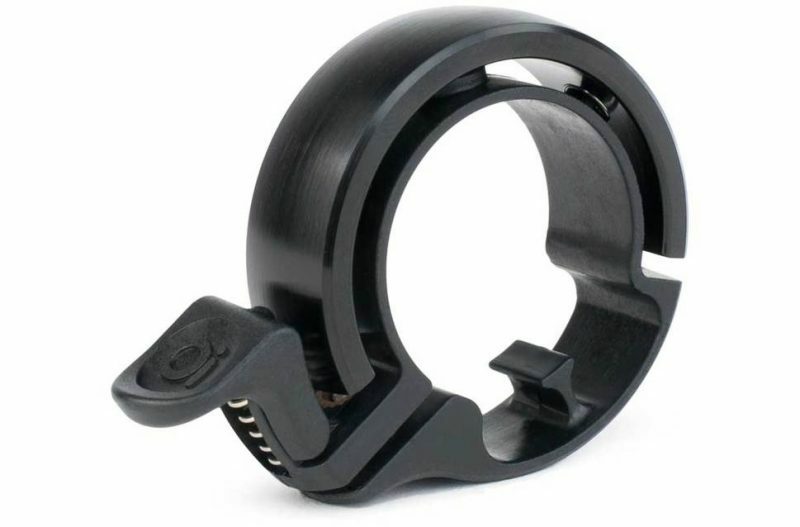 The Knog Oi Bike Bell features a curved piece of metal over a flexible nylon mount, one that can easily stretch out to be suitable on several handlebars. To make it ring, this one uses high tensile springs and plastic actuator that hits the metal when pressed. 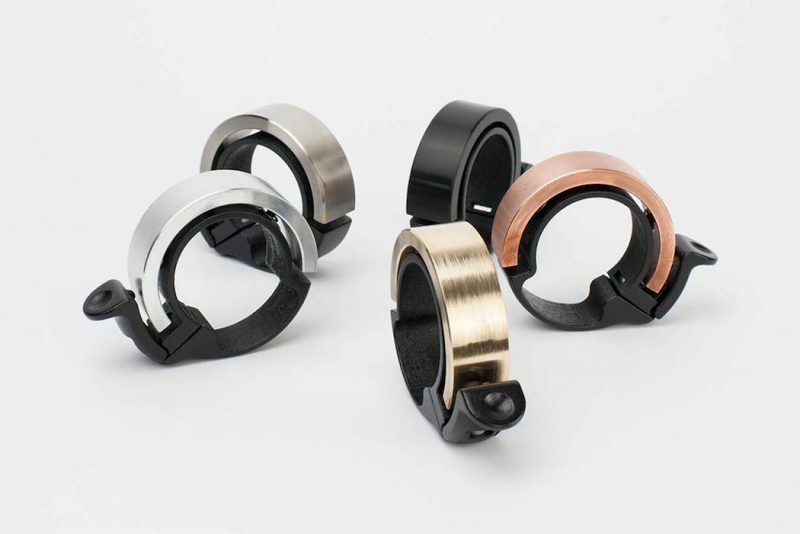 As I’ve mentioned above, Knog offers this bell in 4 hues such as copper, black, brass and aluminum. 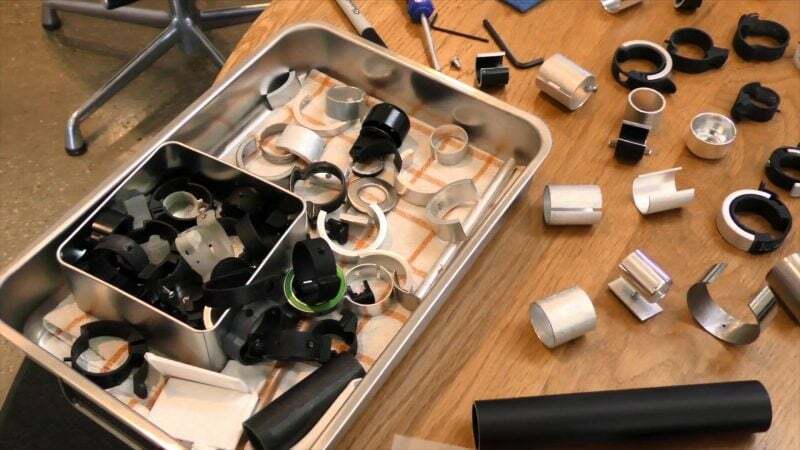 You probably don’t know, but Knog created about 200 different prototypes and tested several combinations of pitch tones to achieve a good balance of sounds and sufficient longevity of volume. The Knog Oi comes with 2 sizes, so it’ll suit your bike regardless of your handlebar size. But you’ll need to make sure you get the right version. Mounting it is straightforward. You can simply pop it over your handlebar, tighten it finger tight and your bike bell is good to go. The sound might be affected if it’s too tight. If you’re after a bike bell, look no further than the Knog Oi. It’s sleek, stylish and doesn’t look anything like a traditional bike bell.